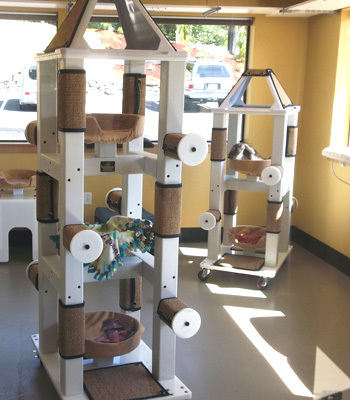 When determining the capacity of communal cat rooms, experts recommend 1.7 square meters of floor space – or 18 square feet per cat – which is more than is typically allotted for a single housed cat. These space requirements are important to note because they mean that group housing does not necessarily save space in a shelter. Cats should have at least three feet to 10 feet between beds and resting areas in a group setting so they can spread out and feel comfortable. In addition to these minimum space requirements, group sizes should not exceed 10-12 cats, even in an extremely large room, per the Association of Shelter Veterinarians Guidelines for Standards of Care in Animal Shelters. For operational and disease-control reasons, it's better to provide several smaller rooms than one large one. Some shelters find that smaller colonies are easier to manage, with four to six cats per colony being an optimal size. An effective approach is to develop some flexibility for how many cats you display depending on daily demand. For example, if it is possible to have two “wings” of adoptable cats, consider opening one wing when traffic is low. On heavy traffic weekends, or when the shelter has big adoption events, both wings may be opened to accommodate higher traffic and demand.